When we came across Nagy Jalkh’s photo of “The Mechanization of Lea” on the Holy Spirit University of Kaslik’s Facebook page, we immediately saw that Lea Saliba had potential and we decided to find out more about her and the motivation behind the implementation of such a project. Lea Saliba is a young woman from Sin El Fil in Lebanon who is currently studying Graphic Design at the University. She is looking forward to being an illustrator or a typographer. She recently participated in her university’s exhibition with a very interesting piece called “The Mechanization of Lea”; a mixed media self-portrait that was initially created for an assignment. She was inspired by observing her dad’s use of mechanical tools. What started as sticking collected pieces together ended up in a search for harmony and beauty for the artist with a contemporary mosaic. The inspiring artwork took two days to complete. Her colors are harmonious and her shapes are easily read. 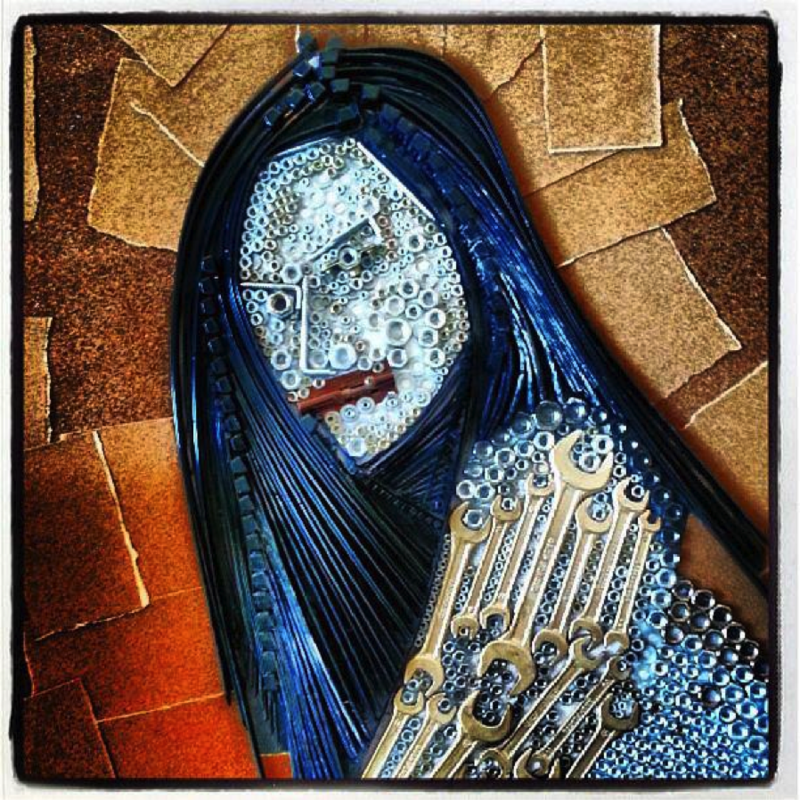 We think that she could do more mosaic pieces within the same spirit and get even more adventurous in the use of more diverse mechanical tools. Saliba’s teacher always said that each element has a value and one could not always find without seeking. Heavily influenced, she got the idea of the self-portrait while watching her dad using his tools and decided to collect them in order to see what she could come up with artistically. One thing is for sure: Lea Saliba never pictured herself working with men’s tools in order to execute a self-portrait: she did not predict it nor did she plan it. On the other hand, she believes that every object should be respected no matter how cheap or small it looks. That’s one statement we can only agree with. For her, this beautiful artwork is not “her style” but an exploration of a new direction which taught her a lot. We believe that Lea Saliba should not turn her back on mosaics and pursue her exploration in that field even if she decided to go for a career in illustration or typography. What do you think?